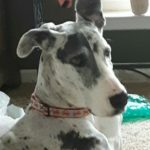 Need help with your Dane or Dane Mix? Surrendering your dog can be a difficult decision. Often, people believe they must give up their dog because they do not know how to handle a particular issue. However, most issues such as housing options, allergies and behavioral issues can often be addressed. Please check our resources page for solutions to common problems. We also encourage you to take a class with your pup, no matter what his or her age may be. Formal classes help with bonding, socialization and structure. One on one class at your home may be easier but a social class with other dogs and people is usually the best option for both of you. If you need the help of a trainer, please choose carefully. Go to www.apdt.com and check out the trainers in your area. If a trainer uses outdated training methods such as leash pops, scruff shaking, and dominant stares, find another trainer. Look for a trainer who is well versed in modern training methods based on scientific research and who understands and uses classical and operand conditioning, desensitization and positive reinforcement training. Check out the link on how to find a good trainer on the resources page of this website. 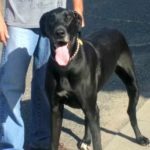 If you've adopted a MAGDRL Dane and are having trouble, please contact us immediately! We have training resources that will do phone consults for free or come to your home for more in-depth consults for a fee. We want you to keep your Dane--please contact us as soon as you think there even may be a problem. If you've determined that you must surrender your dog, you have several options. Please examine each carefully and select best solution. Please note: We do not have a facility — we have foster homes and volunteers who have other responsibilities, many with full-time jobs and families of their own. This means that we cannot take your Dane immediately. You may have to maintain responsibility for your dog for several days/weeks/months until we can arrange housing. 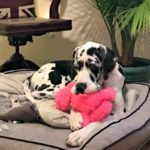 If you truly cannot keep your Dane in the house while we look for housing, consider boarding the Dane at your vet office or a local boarding facility for a few days while we make emergency plans. 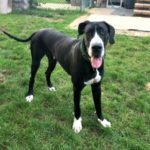 Please don't dump the Dane at a shelter because we can't respond quickly enough for you — we truly are trying to do the best for your Dane while struggling with limited housing options, monetary concerns, and personal issues. This is not our day job: we are trying to provide you and the community with a service because we love Danes. 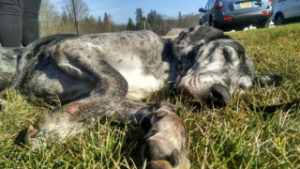 Please read our “How to Surrender a Dane” page carefully before you contact us.